Dr. Bassam has been an associate professor at Geosciences Department at CPG, KFUPM since 2007 in addition to his incumbency as an Acting Director, Environment and Sustainability Section, Environment, Health and Safety (EHS) Dept. KFUPM since 2014. From 1987 till 2005 he had assumed the role of Senior Research Engineer, Center for Environment and Water (CEW), Research Institute, KFUPM. 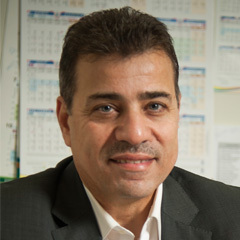 Between 2005 – 07 he was appointed as Manager of Central Analytical Laboratory (CAL), Center for Environment and Water (CEW), Research Institute, KFUPM. M.Sc., Civil Engineering, KFUPM, KSA, 1987. B.Sc., (Hons. ), Civil Engineering. KFUPM, KSA, 1984. Investigation the fate of organic and inorganic pollutants in the water, air and soil environments. Assessment, monitoring, and remediation of water, groundwater and soils contaminated with hazardous pollutants. Tawabini, B., Khararjian, H. and Fayad, M. “Trihalomethanes (THMs) Formation in a distillation process”. Desalination, 66 (1987), pp. 403-414. Attar, K.; B. Tawabini; Pambid, E. and A. Abdel-Aal “Trace Elements in the Leachate of Automobile-Scrap Shredder Waste”. J. Waste Management, Vol. 11, No. 4, (1991), pp. 283-286. Fayad, N. and Tawabini, B. “Survey of Saudi Arabian Drinking Water for Trihalomethanes”. J. of Bull. Environ. Contam. Toxicol. (1991) 6:305-312. Tawny H. M., N. Sridhar, B. Tawabini, N. M. Abbas and T. N. Rhys-Jones “Thermal Stability of Pt-Aluminide Coating on Nickel-Base Superalloys”. Journal of Materials Science 27, (1992), pp 6463-6474. Attar, K.; El-Faer, M., Rawdah, T. and B. Tawabini “Levels of Arsenic in Fish from the Arabian Gulf”. J. Marine Pollution Bull., Vol. 24, No. 2, (1992), pp 94-97. Iob, F. Al-Yousef, B. Tawabini, A. Mohammed, and N. Abbas “Simultaneous Determination of Benzotriazole Copper Inhibitor and Microbiocidal Isothiazolinenones by HPLC”. Journal of Chromatography, Vol. 661, Nos 1+2, Feb. (1994), pp. 245-248. Iob A., Tawabini et al. “Hydrocarbon Group (PONA) Analysis of Reformate by FTIR Spectroscopy”. FUEL journal, Vol. 75, No. 9, (1995), pp. 1060-1064. Iob A., B. Tawabini et al. “Prediction of Research Octane Number of Reformed Gasoline by FTIR Spectroscopy”. FUEL journal, Vol. 74, No. 2, (1995), PP. 227-231. Tawabini and H. Abdel-Aal “Extraction of Energy from Sabkha Deposits in Saudi Arabia”. Perspectives in Energy, Vol. 4, (1997-1998), pp. 255-260. Abuzaid, N.; Al-Malack, M.; Nakhla, G.; Essa, M. and Tawabini, B. “Effects of Dissolved Oxygen and Surfactant Treatment on the Sorptive Capacity of a Local Soil for Phenol’. J. of Environmental Science & Health, A35 (3), (2000), pp. 263-280. Best Teaching Award. College of Sciences, KFUPM. 2011. Nominee for the Best Research Award. Center for Environment and Water, Research Institute, KFUPM, 2007. Long Services Award of 30 years, KFUPM. Dhahran, KSA. 2014. Long Services Award of 20 years, KFUPM. Dhahran, KSA. 2004. Long Services Award of 10 years, KFUPM. Dhahran, KSA. 1994.